Drag hunting (or draghunting) originally came about in the early 1800s in the UK. 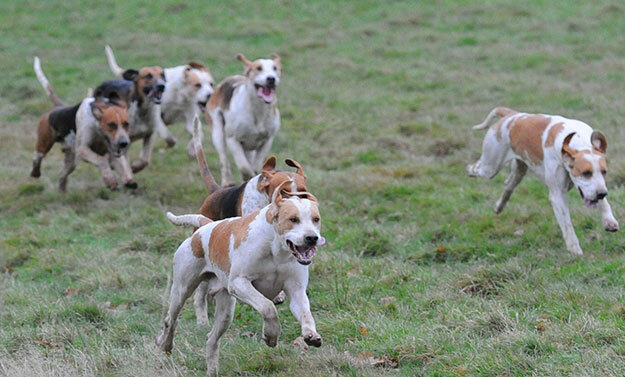 It was used as a way to test the speed and agility of hounds. In order to keep an eye on the hounds, they were followed on horseback. The expression Drag hunting might evoke something akin to cruelty, because it has the word ‘hunting’ in it. However, it is a very humane sport and it is more about tracking than actual hunting. Drag Hunting is also known as ‘clean-boot’ hunting. It is done using Bloodhounds, the magnificent dogs known for their remarkable trailing and tracking skills. A scent is laid either using artificial scent, or the scent of a human, along a predetermined route. The runner lays the artificial scent by dragging a cloth dipped in the artificial scent on the ground. This will be done approximately 10 to 30 minutes before the race starts. There is no actual hunting of animals or humans. The term ‘clean-boot’ is another name for the runner, which gives this sport its alternative name. A drag hunt is set up in a similar way to a cross country ride. It takes place over a predetermined course, with jumps or obstacles. The dogs often make their way through farms, and because many drag hunts have been going on for many generations, there is a good relationship with the farm owners and the hunt staff. The farm owners provide preset routes so there is no risk of the horses or dogs damaging the crops and farm. If there is any damage on the farm along the route, the hunt staff will make the required repairs. Drag hunting can be an exciting sport for the riders, and different hunts can have different durations and skill level requirements. For beginners, a shorter course with simpler jumps will be the best start. There are 18 draghound packs registered in the UK, so there is sure to be at least one option for every skill level.